Philadelphia ? Those famously churlish Philly fans can’t hide behind the urban legends. The truth is out there: They simply booed Santa Claus. Frank Olivo — the erstwhile Santa in question — wasn’t drunk, nor was his red suit in tatters that December day in 1968 when he walked onto the field for the halftime show, only to be met by a chorus of jeers and a snowball fusillade from Eagles fans. But by all accounts, they had cause for an ugly mood. “The fans carried on like that because the Eagles were horrible,” Olivo said. The antics at halftime of the Eagles’ final regular-season game, beamed around the country on Howard Cosell’s national sports show, helped cement Philadelphia’s reputation for having rogue, rowdy sports fans. While the vibe in Philadelphia decidedly is more brotherly this year with the Eagles headed to the Super Bowl, the 1968 team, at 2-12, truly was bad. Quarterback Norm Snead threw for 11 touchdowns and 21 interceptions that season. Coach Joe Kuharich led the team to an 0-11 start, and fans flocked to old Franklin Field wearing “Joe Must Go” buttons. One Sunday, the throng cheered as a plane flew overhead, towing a banner suggesting the coach leave more than just The City of Brotherly Love. The Eagles were just good enough to give Buffalo the top pick in the next NFL draft — running back O.J. Simpson. 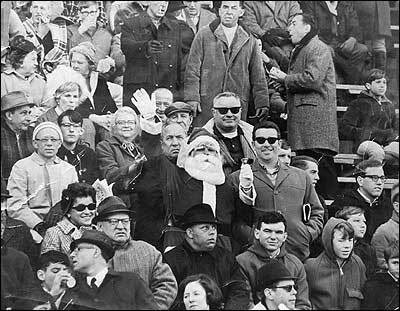 Frank Olivo, center, is shown in this 1967 photograph wearing his Santa suit at an Eagles game. Olivo, known as the Santa who was booed and dodged snowballs during halftime of a 1968 Eagles game, believes the infamous snowball episode launched Philadelphia's reputation for boorish fans. Olivo, whose family held Eagles season tickets from 1958 to 1985, revels in his unlikely place in franchise history. The booed Santa affair merits an entire chapter in “The Great Philadelphia Fan Book,” which Macnow co-wrote in 2003. “I’ll be dead and that book will still be at the bookstore or on somebody’s shelf. That means something to me,” said Olivo, 56, of suburban Media, who toiled as a barber, craps dealer and car salesman before health problems forced him to retire. Still, he wants people to get the story right. “They say, ‘He was drunk. He had a rotten outfit.’ They don’t even remember. A lot of them weren’t even here,” Olivo said. Gov. Ed Rendell, a longtime Eagles season ticketholder who attended the 1968 game, agrees that fans were venting their frustration not at the sad-sack Santa, but at the Eagles — even though they had played to a first-half tie with Minnesota. The buildup to the bombardment of Olivo probably began four years earlier, when Kuharich took over and Sonny Jurgensen, who became a Hall of Fame quarterback, was traded for journeyman Snead. By 1968, Olivo, then a skinny 20-year-old kid, had been wearing a Santa suit and fake white beard to the last Eagles home game for several years. As halftime approached in the game Dec. 15 against the Vikings, the Eagles’ entertainment director asked him to replace a hired Santa stranded by the snowstorm. Thunderous boos erupted from a crowd of 54,535. “When I hit the end zone, and the snowballs started, I was waving my finger at the crowd, saying ‘You’re not getting anything for Christmas,'” Olivo recalled.